Joining fee and first month’s fee (prorated based on joining date) are due at registration for e-pay (checking/savings account or credit/debit card verification required) memberships. Six and twelve month full pay memberships are also available. 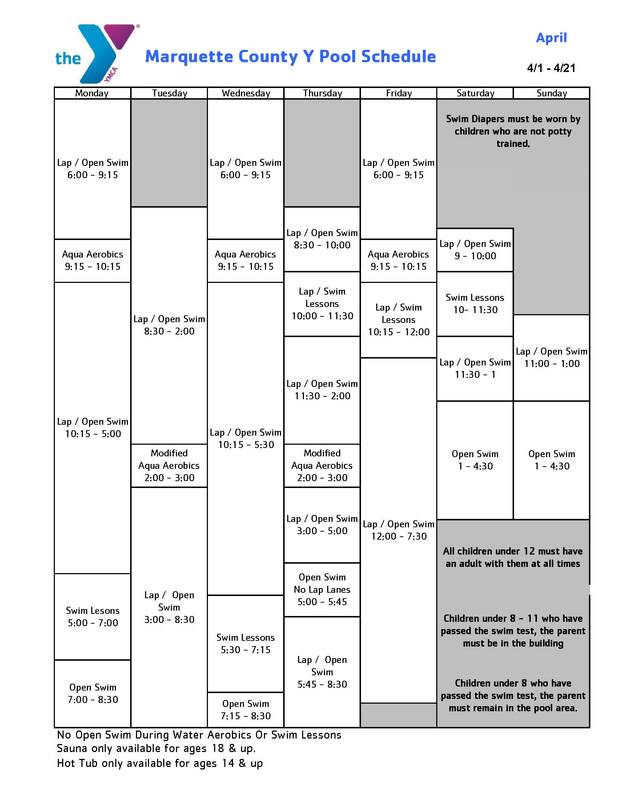 Day passes are available for children under 18 years old ($6 Marquette & Negaunee), adults ($10 Marquette; $8 Negaunee) and families ($22 Marquette; $18 Negaunee) or pick up a 11-visit punch card for individuals ($100). 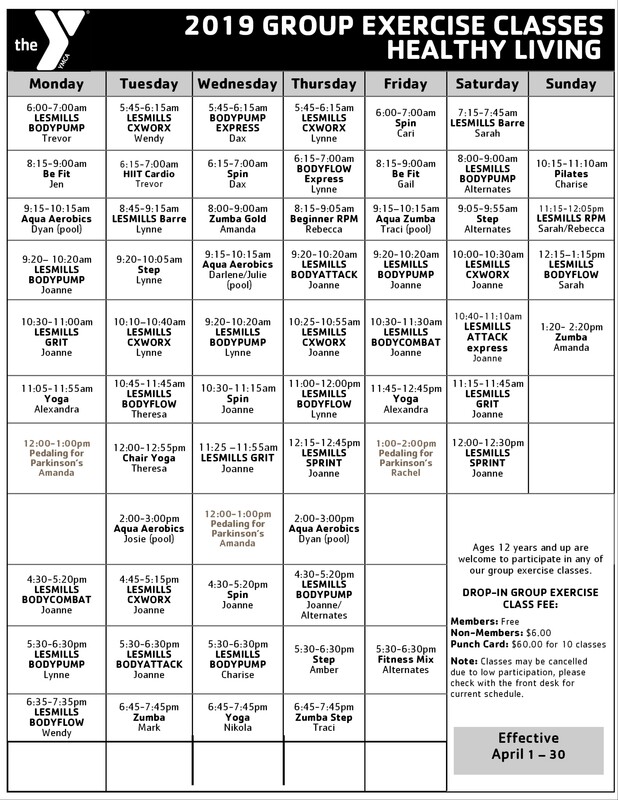 Group Exercise Classes and Drop in Adult sports are $6 per use. The Y is accessible to all people. Financial assistance is offered to individuals and families who cannot afford membership. Learn more about financial assistance. 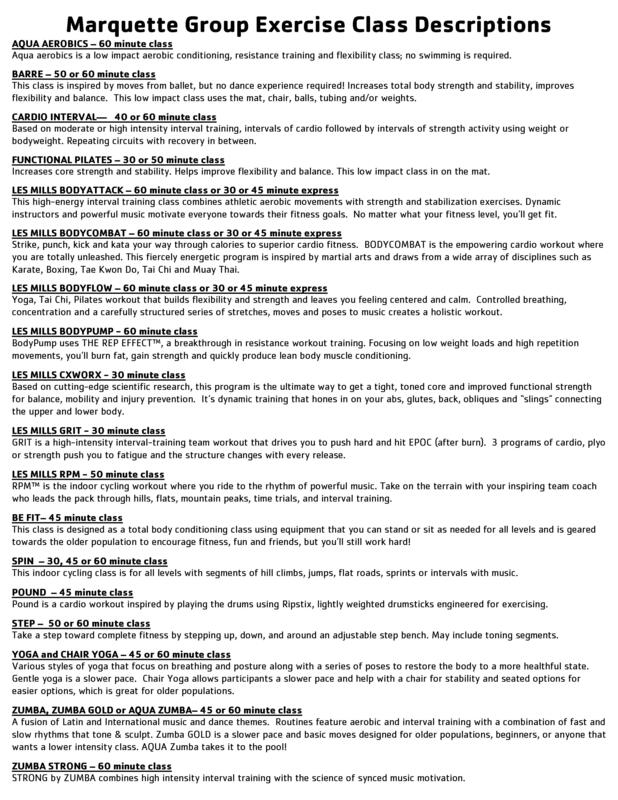 YMCA memberships run from the join date to the end of the month. The first month’s prorated membership dues, plus applicable joining fees, and printed documentation of bank account and routing number or debit/credit card are due at the time of enrollment. Monthly payments will be drafted on the 1st of each month. All returned payments (checks, electronic funds transfers and credit card payments) will result in a $20 fee. We will process all returned payments a second time on the 10th of the month with the return fee added. 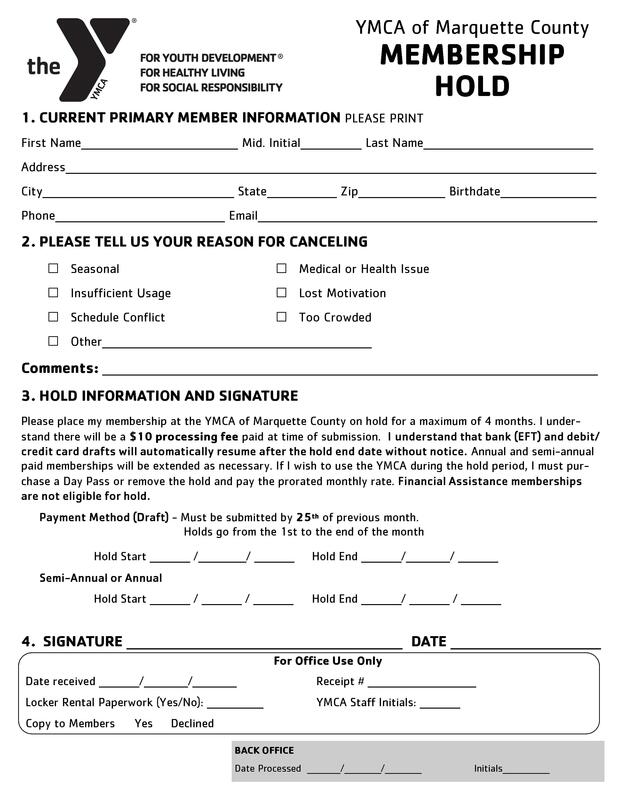 All outstanding balances and fees must be resolved before the member can participate in any YMCA programs. 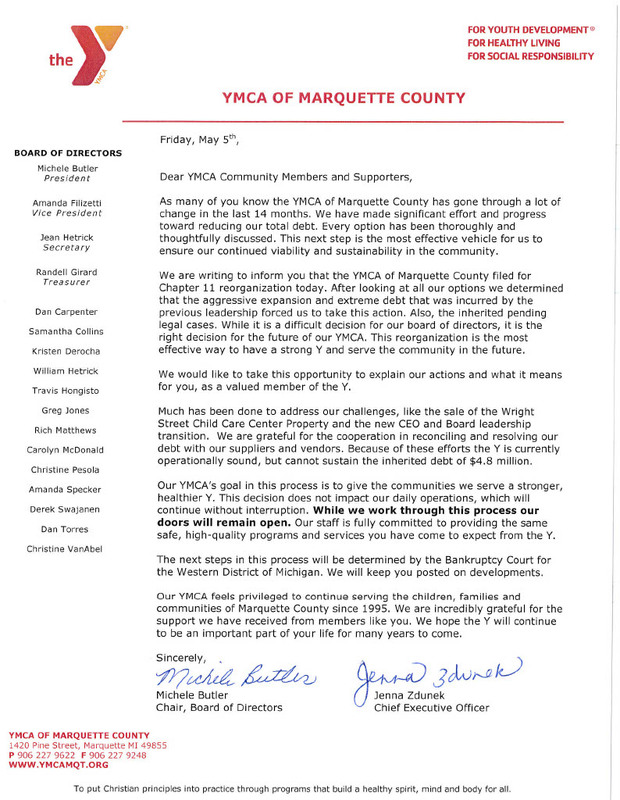 The YMCA is in no way responsible for any additional fees charged by your financial institution. Memberships may only be placed on hold by completing a Membership Hold Form. Forms must be submitted by the 25th of the previous month. Bank draft will resume automatically. Phone requests will not be accepted. Members enrolled in classes and scholarship recipients may not place their membership on hold. 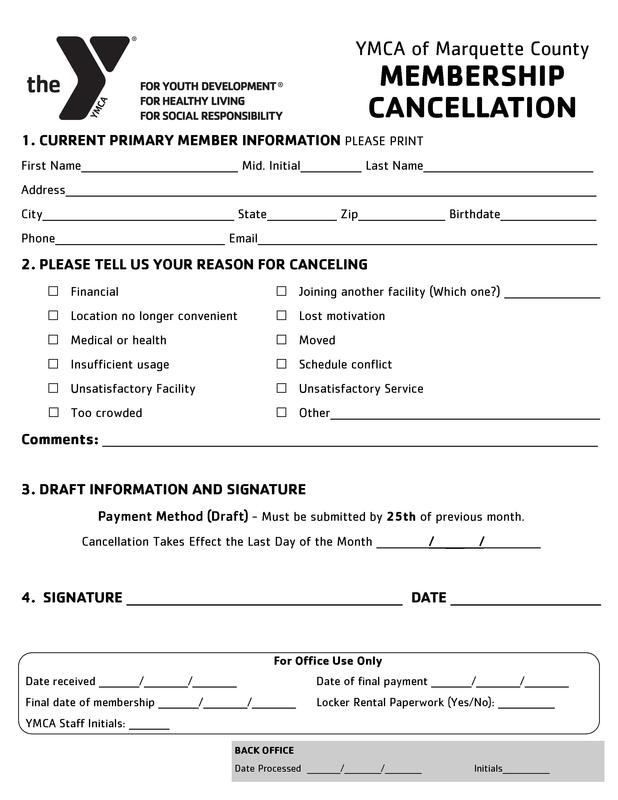 Memberships may only be canceled by completing a Membership Cancellation Form. Forms must be submitted by the 25th of the previous month. Phone requests will not be accepted. Members enrolled in classes who cancel their membership will be assessed the non member rate for those classes.